has passed since my last post -- but there's a good reason! I've been busy, with a capital 'B'. Where shall I begin? Since April 9th, I've worked part-time at our local Library, gone to the 11th annual Lacombe Art Show, volunteered at Superfluity, the thrift shop in Stettler, sung at church (and had practices for same), gone to Calgary and to Edmonton twice each, endured two spring blizzards, and won a prize at a gallery show. It may have been over-the-top busy these past few weeks, but it's also been a great deal of fun! 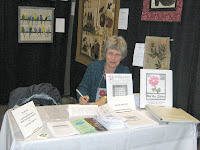 Sally is a calligrapher and artist who paints and writes on both paper and fabric -- mainly canvas. From her I bought a very pretty little canvas tote that was inscribed with one of my very favourite sayings: "Bloom where you're planted." It was decorated with a pot of purply flowers -- the name of which I forget at the moment! 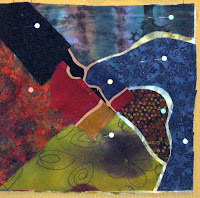 She and I had a long chat about painting and working with inks and dyes on fabric, and about showing work. She had a single booth, the cost of which was so reasonable for the 3 days, that I have decided to use next year's show as my Firm Visioning Goal -- and prepare my body of work with the show in mind. I hope to see Sally again then, if not before! 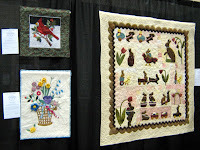 My first trip to Calgary was to my mid-April meeting of the Wild Rose Stitchers, the only Alberta Chapter of The Applique Society, which meets on the third Wednesday of each month -- year 'round -- at 10 a.m. at Addie's Creative Fabrics. That particular meeting was full of our last-minute plans for Quilt Canada 2010, which began shortly thereafter (April 24) and ran through May 1. Suddenly, the Week was upon us -- and we were ready! Here's one of our members, L, sitting at the table at our 51-piece exhibit on the morning of April 28 (the exhibits were open from the evening of April 27 through to 5 p.m. on May 1). I was volunteering with her that day, and it was a full one indeed. We had lots of visitors, asking questions, and were thrilled to be able to link people up with TAS chapters near them, from Dawson City, Yukon, to the 'Cyberspace' chapter at Yahoo.com. That night we had a spring blizzard, complete with heavy, wet snow, howling winds and icy roads. We awoke to 10 inches of snow on our vehicles and virtually impossible side streets. Still, the show must go on, and most of us volunteering managed to get back to the show. In fact, by the time I finished my second day as a volunteer (April 29), you could hardly tell we'd had the storm. Alberta in April; ya gotta love it! 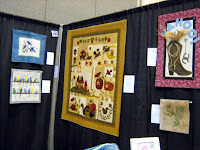 Thursday, April 29, from noon through almost 6 p.m., I worked at the SAQA exhibit, Synthesis, which up till Quilt Canada 2010 had been travelling in Eastern Canada and the Maritimes. From Calgary, it's scheduled to go to Fibreworks on the Sunshine Coast of B.C. later this summer. 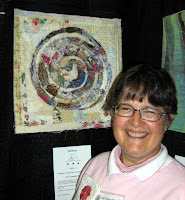 I was blessed by J, one of the exhibit's other volunteers, when she took my picture next to my piece, "Snippets: An Art Quilter's Learning Curve". This was the first time I'd seen all of the pieces in one place -- and it was a thrill to be there with my heroines, Anna Hergert, Pamela Allen, Laurie Swim and Karen Goetzinger! Another thrill came when a total stranger told me that as far as she was concerned, my piece, "Prairie Autumn" , was the best in the show! She asked me what I'd sell it for and when I told her, she said, "...reasonable, for a piece that size. I was over the moon to have my work validated by someone who was not a friend, colleague or family member. This, and my experience at the FFAA Show (see below) have given me renewed confidence, energy and motivation for my work, and for my future. Stay tuned for forth-coming photos of my efforts! I arrived home Sunday to no phone service. Turns out the storm had knocked out lines in the area, and my land line was affected. Blessedly, anyone I needed to contact was on e-mail! Bright and early on Thursday, May 6th, I was on my way to Edmonton for a 3-day version of Anna Hergert's workshop, "Cause and Effect". As it's usually 5 days, it was a pretty intense time! 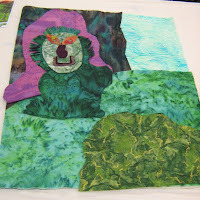 There 11 of us had a great deal of fun melding layers of painted plastic wrap, and testing Tyvek, acrylic felt, used dryer sheets, paper napkins and landscape fabric with stitching, paint, heat guns and irons. I started a new sketchbook for this class; though I have expanded my horizons already with those 3 days, I know I have more experimenting to do -- and I have some great ideas for the next piece in my 'nature' series. On the evening of May 7th, most of our class -- and Anna -- were present for the Opening of "Green", the latest show from the Focus on Fibre Arts Association. What a thrill to find that my entry, "Picked for the Ripening", won 3rd Place in my division: "Small Wall-hanging, Original Design"! (That's it next to me, the bottom of a trio of small hangings.) Even better, at least 1/2 dozen of us in Anna's workshop had entered -- and won -- so Anna was thrilled and proud of and for all of us. What a great group of which to be a part! My goodness, what an exciting month! Congratulations on your win! Isn't it wonderful to have your art appreciated by people you don't know! It does give you confidence and excitement to continue your work. Well done!